Court to EPA: Get Moving on Coal Ash! Too close for comfort? 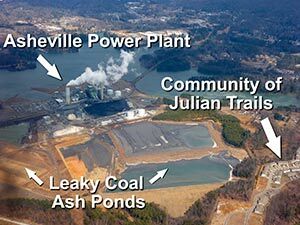 The Asheville Steam Station’s coal ash ponds loom over nearby neighborhoods. Last week, a federal judge agreed with environmental and public health groups that the U.S. Environmental Protection Agency needs to set federal regulations for the safe and proper disposal of toxic coal ash. The court order is a step forward for Appalachian Voices and other environmental groups who went to court in 2012 regarding the EPA’s failure to finalize regulations for coal ash disposal that were proposed in 2010. Yet, at the same time that a lawsuit about the EPA’s rulemaking timeline is moving forward, 93 percent of the agency’s staff is furloughed because of the government shutdown. Coal ash is a by-product of burning coal for electricity and holds hazardous amounts of carcinogenic metals such as arsenic, which can leach into groundwater and surface water systems. Coal ash is the nation’s second-largest industrial waste stream but is currently not subject to federal regulation. The EPA has delayed its coal ash rulemaking process, and the environmental groups claim the agency is required by law to update those guidelines. The order of the U.S. District Court for the District of Columbia offered little details about the timing or substance of the EPA’s rulemaking but said it will issue a Memorandum Opinion within the next 30 days with more specifics. For now, the decision marks the first step towards federally enforceable safeguards, monitoring, and protections against coal ash. In its order, the court did deny one of the environmentalists claims regarding testing procedures for coal ash contamination, but more details are needed before the groups are fully able to understand the implications. Coal ash has already contaminated more than 200 rivers, lakes, streams and aquifers with toxic pollutants like arsenic, lead, selenium and mercury. In 2008, a spill at the TVA Kingston Fossil Plant in Harriman, Tennessee, dumped one billion gallons of coal ash over 300 acres, destroying homes and poisoning rivers. That spill led to the EPA proposing in May 2010 the first federal regulations for coal ash disposal. The agency never finalized that rulemaking, leaving open the opportunity for the power generating industry and some members of Congress to push for legislation that would prevent the EPA from ever setting federal regulations.